In 2019, Rolls-Royce will launch SAVe Energy, a liquid-cooled lithium-ion based energy storage system capable of producing 10-18MWh for ferries, cruise vessels and multi-purpose vessels. Featuring a modular design that enables the product to scale according to energy and power requirements, SAVe Energy complies with international legislations for low- and zero-emission propulsion systems. The product’s development work has been partly funded by the Norwegian Research Council of Norway’s ENERGIX program, which comprises shipowners Color Line, Norled and the Norwegian Coastal Administration Shipping Company. SAVe Energy, which was recently class approved by DNV GL, is be delivered from the Rolls-Royce Power Electric site in Bergen, Norway, as part of the company’s offering of complete ship systems. SAVe Energy can be applied to several areas including peak shaving, spinning reserve and battery powered vessels. Combined with an LNG- or diesel-powered engine in a hybrid solution, it will, says Rolls-Royce, increase efficiency and reduce emissions, and can be coupled with most types of propulsion units. 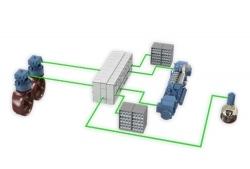 In a hybrid set up, SAVe Energy handles the peak load, while the main power generators will relate to the average load and not reduce the propulsion units thrusting capabilities.